Hi! Sharing some very special and happy news today... Shane and I are engaged! I am so ecstatic to share our proposal story on this blog because Shane incorporated my blog (which is practically my baby) into his big surprise plan and that alone already means so much to me. Unfortunately it wasn't as easy as 1, 2, 3 for Shane as he prepared months in advance for the big day and he had to overcome several bumps along the way but I will let him share those stories since I get the pleasure of sharing his successful proposal =D. Before I share the story, this is the outfit I wore on the day of the proposal. Shane told to wear something "blog worthy" so that he can take my pictures for the blog and my red flag should have gone up for that because he rarely offers to take my pictures! It's a good thing I listened to him because if it were up to me I probably would have hung out with him in jeans and a sweatshirt since I was just getting over a nasty cold/flu and those pictures surely would not have been blog worthy. Shane actually intended to ask the Sunday after my sister and I got back from Italy (I guess distance does make the heart grow fonder, haha) but as I mentioned I got hit with one of the worse cold/flu I've ever experienced so I was bedridden that whole weekend. As I was starting to feel better I set up brunch plans with our former colleague for April 13th since we flaked on him the week before because I wasn't feeling well. When I told Shane our plans he told me to schedule it for a late lunch because he had a surprise for me that day. 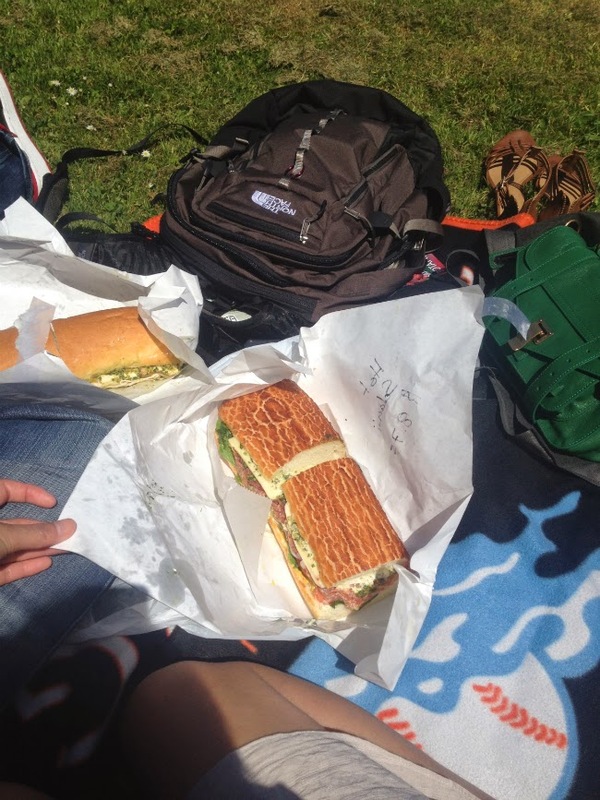 Fast forward to April 13th and Shane takes us to the San Francisco Botanical Garden where we set up a little picnic with sandwiches that he picked up from Little Lucca. At this point of the day I started to have an inkling that he was going to propose and that was because of his surprise comment from the week before (he rarely conjures up surprises), his willingness to take my blog pics, and hints that my mom had been dropping (oh mom...). Now we've always talked about getting married and I knew that we eventually would but we've never actually gone ring shopping or anything of that sorts so it was up in the air when it would happen and if it would actually happen then. By the end of half of my sandwich my hands are covered in garlic sauce and jalepeno pesto and in no condition for a ring so I scatter to the restroom to wash them. I get back to the blanket to find that Shane has wrapped up the other half of my sandwich (he is always so thoughtful) and is ready to explore the garden (or so I thought). We sit on the blanket for a little bit longer and nothing happens so I tell Shane that I totally thought he was going to propose today and why I thought that. Well he must've expected me to say such a thing because he totally played it off! There was no pause between my thoughts and his response and his response rolled off his tongue and was completely natural. He had me convinced me that he was not going to be proposing. ... And it sure wasn't his camera! Shane captured those shots (I was wondering why the heck he was taking pictures of me grabbing his camera) moments before he came over to get the box from me, get on one knee, and pop the question. To say that I was shocked would be an understatement - I think I was in so much disbelief that Shane had to ask me if "that is a yes". Well of course it is! The excitement over this new chapter of our lives together was so overwhelming that we ended up leaving shortly after our engagement because there was no way that we would be able to fully appreciate the beauty of the garden with such happy news to share with those we love and with each other. In fact one of my dear friend made me realize that Shane and I didn't even take an engagement selfie of this milestone in our relationship. Pictorial evidence or not, I will always remember and cherish this moment for the rest of my life. I can't wait to see what the future brings for us! What a precious story Jenny, congratulations to you and Shane! Huge congratulations to you both! I wish you both a lifetime of love and happiness!